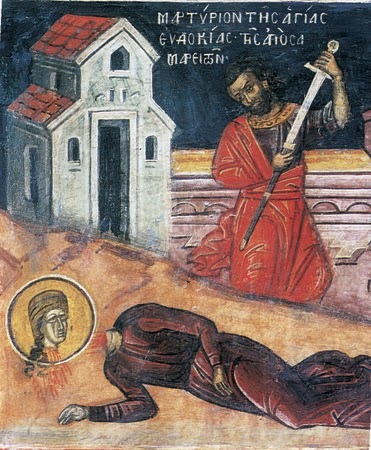 Saint Eudokia came from Heliopolis in Syria and lived in the 2nd century AD. She spent several years of her life in prostitution and debauchery. At one point she became heavily ill and this proved to be a great blessing for her. Apparently it happened by the will of God, having become the cause for her one hundred and eighty degree turn and radical change of life. As long as she was ill, all her friends abandoned her, and this fact saddened her very much, leading her to the point of cutting off all contact with them. After the restoration of her health she settled in a secluded part of the city. There she met some people whom she liked, because she was impressed by their way of life, their morals and their behavior. Communication with them resulted in leading her to the Church, to be catechized and baptized. After her baptism she distributed all her belongings to the poor and followed the ascetic life. She lived in deep repentance. Having purified her vessel of all the stains of her impassioned life she reached illumination and theosis. Indeed, she was made worthy to seal her testimony for Christ with the blood of her martyrdom, which is why she is called a venerable martyr. Christ said: "Truly I tell you, the tax collectors and the prostitutes are entering the kingdom of God ahead of you" (Matt. 21:31). That is, the tax collectors, who were considered extortionists and unjust, and prostitutes will enter the kingdom of God before you, because when they repent, they do so with remorse and the full awareness of their sympathy. The tax collector Zacchaeus and the prostitute who anointed with myrrh Christ's feet, showed the path of true repentance followed by many others through the centuries. Those who became conscious members of the Church after a great fall in their life these, mostly, live in deep repentance, humility and self-reproach, having no great thoughts about themselves and living without judgement of anyone else. This is an Orthodox ethos. Conversely, those who attend church regularly and work in one way or another in the environment of the Church, if they have not undergone the good alteration and have not reached "to the measure of the stature of the fullness of Christ" (Eph. 4:13), they are possessed of spiritual self-sufficiency, which is a great spiritual disease. They consider themselves purified and illumined and for this reason they do not feel the need to weep for their sins. They easily criticize, and see everywhere enemies and persecutors of themselves and of the Church, as well as instruments of darkness and evil. This mindset one encounters more often in the Protestant confession, but also those who have been influenced by it. That is, those who have a sense of self-righteousness, innumerable individual gifts and virtues, and reject all those who have an opposite view to theirs. This is clearly seen in Protestant songs, which are not even unknown in our country, since we have received and accepted their strong effects. We will record some characteristic excerpts: "Hail to us, we are chosen by the Highest..."; "We are the true builders of a new life, with the wings of divine inspiration all paths are open to us..."; "we are bright children of the day, whom the children of the night cannot feel...", etc. Essentially it is a pharisaical attitude of arrogance, self-promotion and self-righteousness which Christ condemned, and which creates a large number of daily problems in the body of the Church, and in society in general. "Do Thou open unto me the doors of repentance, O Giver of Life; for my spirit goeth early unto Thy Holy Temple, bringing the temple of my body all defiled. But as One compassionate, cleanse me by Thy compassionate mercy." "Where shall I begin to lament the deeds of my wretched life? How shall I begin, O Christ, to relieve my present tears? But as Thou art deeply compassionate, grant me forgiveness of sins." What Dostoevsky says is striking, in his own characteristic way, concerning the genuine evangelical ethos. Referring to the Coming Judgement he says that Christ at that hour will turn sternly to those who consider themselves pure and worthy of reward and will tell them: "Depart from Me accursed ones to the eternal fire." They will respond with questions: "Us Lord? Did we not prophesy in Your name and in Your name cast out demons?" But He will call them workers of iniquity and will tell them that He doesn't know them, because they were arrogant and proud. Then He will turn to the tax-collectors and prostitutes who sincerely repented and He will tell them with gladness and sweetness: "Come, blessed of My Father, and inherit the Kingdom prepared for you." Then they will ask perplexed: "Us Lord? We are not worthy. We did nothing good in our life. We did not pass outside of a church nor did we dare look at it, because we are very sinful." Then the Lord, says Dostoevsky, will tell them: "This is why I am putting you in Paradise, because you are humble." The path to purification passes through self-criticism, self-judgment and self-reproach and leads to illumination and deification, quietly and humbly. Source: Ekklesiastiki Paremvasi, "ΟΣΙΟΜΑΡΤΥΣ ΕΥΔΟΚΙΑ Η ΑΠΟ ΣΑΜΑΡΕΙΤΩΝ", March 2005. Translated by John Sanidopoulos.